Create lasting family memories in this architectural masterpiece. 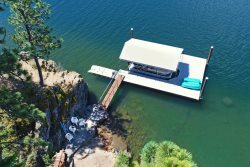 Featured in Spokane magazine (p.66), Caribou Lodge is a premier waterfront home in Kidd Island Bay that is truly breathtaking. Bring the whole family to enjoy unmatched views and 5 floors of luxury upgrades and furnishings in this Lake Coeur d’Alene gem. The home’s top of the line architecture includes gorgeous exposed beams and intricate masonry that make this 6,870 foot lodge feel more like a castle. All ages will feel as if they’ve stepped into a fairytale when they descend down the spiral staircase to the very bottom floor with walls lined in elegant stonework. When you’re done exploring you can relax in the large jetted soaking tub, enjoy the indoor bar and entertainment, lay by the fireplaces, or whip up a home cooked meal in the spacious gourmet kitchen. (P.S. There’s plenty of space to recruit a few sous chefs to help with meal prep!) Throughout the home, decks offer a welcoming place to socialize in the sunshine. Any season, there is no better place to celebrate the holidays than Caribou Lodge. With clear views of The CD'A Resort, this is the perfect home to view the 4th of July, day after Thanksgiving, or New Years Eve fireworks show. With a bay that freezes over, duck hunting and ice fishing are among the popular activities in Kidd Island Bay as well as Bald Eagle watching from the wrap-around deck—prime in December and January. Snowshoeing, snowmobiling, cross-country skiing, snowboarding, tubing, shopping, dining, and local events just a few of the activities to look forward to. With 5 bedrooms—including 2 sets of full bunk beds—and 6.5 bathrooms everyone has the space they need for a dream vacation. The top floor (5th floor) has a large living area with a wet bar and seating to watch television. It also offers two large bedrooms with king size beds and en-suite bathrooms. The entry floor (4th floor) is where you’ll discover the jewel of the home—the master suite. This large bedroom offers a king size bed, private deck to enjoy your morning coffee overlooking the beauty of Kidd Island Bay, and a beautiful custom stone bathroom. The fancy jetted soaking tub faces towards expansive windows that offer sparkling lake views that are sure to encourage complete serenity. The main living area (3rd floor) offers one-of-a-kind views, a huge custom gourmet kitchen with a dining table that seats 6, an additional bar style table in the kitchen that seats 6 more, and two large adjacent living rooms with space for the whole family to gather around the fireplace. A full bathroom with a shower, a pantry, laundry, and several doors that open to the deck are also located on this floor. The lower floor (2nd floor) has a large bedroom with 2 full-sized bunk beds and direct access to a lower deck, plus a bathroom with a shower. For entertainment options, you’ll find a pool table, game table and TV room with a sectional. There’s also a nice gas fireplace in this room. The bottom floor (1st floor) is where you’ll find that marvelous spiral staircase and beautiful castle-like stonework. There’s also a full bathroom and easy access to the 120 feet of private sandy beach, a private boat dock, and an amazing stone patio area. Rich, at the management company saved our vacation. When we arrived, the house next door had smoke alarms going off and my daughter got locked in the bunk floor bathroom (she couldn't get out but it could be opened from the outside to let her out). I called and was told these things would be taken care of as soon as possible. Luckily your team had the neighbors phone number to be able to get into the house and turn off the alarms and maintenance came and fixed the door handle so no other person would get locked in. I was happy with the quick response to both issues. The house was gorgeous and we all had a great time. The craftsmanship of the house. It was gorgeous! The view and peacefulness of the area was so nice. Very spacious and the kids loved having their own space downstairs. Everyone was very accommodating and professional. The friendly maintenance team came very quickly to help us with a couple of things we had questions about. The office staff was very nice and helped us with firewood for outdoor fireplace. Agents were very kind to get us permission to utilize elevator while aunt was visiting us in home. You guys run a great operation! AMAZING! Absolutely a wonderful property. Beautiful home and very comfortable. A vacation to remember. We will return.